ALESSANDRO ROLANDI – Bernard Controls — What.happens.now? Alessandro Rolandi is an Italian-born artist who also currently holds the position of Director of the Social Sensibility Research & Development Department at Bernard Controls Asia, which he founded in 2011. Trained in Chemistry, Experimental Theatre, film-making and Art History, he has been living and working in Beijing since 2003, as a multimedia and performance artist, director, curator, researcher, writer and lecturer. His work focuses on social intervention and relational dynamics to expand the notion of art practice beyond existing structures, spaces and hierarchies and engage directly with reality in multiple ways. Q : What is a Social Sensibility Department ? It is a real Department within Bernard Controls, created in 2011, which has a transversal role within the company. It was created and is managed by an artist, in this instance me, and its purpose is to act on and improve social interactions within the company by introducing artists into the company on a weekly basis. This Department could of course exist in any other organisation and though we have had interest from other companies, it has yet to be duplicated. I am hoping it will be and that it will be seen as a necessary part of any organisation in the future. The Department must be considered a core aspect of the company, in the sense that during hard times, the Department should not be closed, similarly to the Human Resources Department for instance. At the same time, the Social Sensibility Department (SSD) offers artists an alternative economical model. When Guillaume Bernard and I defined the Department, we designed it in a way that it would finance an artist to the same level as a State grant to do research, not to his or her own art but research: to talk with people and find new themes and inspiration. The idea is that this way artists – and I mean all kinds of artists, including art students and not just experts in social practice - can experience working within an organisational work structure. Art needs to impact reality and corporate work is a huge aspect of our reality. It is the principal way in which we have structured society. The SSD offers a framework for the artist to experience this. It does require artists who are willing to step out of their comfort zone. The studio is an uncomfortable place for most people but, as the workplace of the artist, it is an environment of unbridled freedom where he or she can express whatever they want in however way they wish. The corporate world is much more restrictive and that for the artist is maybe more difficult, but for me vital to have experienced. Q : Could you please give me a few examples of the work that has been done ? We have had over 40 projects so far so it is very difficult for me to choose just a few examples. Here are four from visiting artists - including myself for the first one - and three from workers. This begins to show you the breath of work that has been done already. Q : So how do you see your role within the company ? How do you define a Social Sensibility Manager ? And what are your ambitions for the position? First of all, the Department appears on the organisational chart of the company and I am an employee. I am not a consultant and that is very important because it is a true and permanent change on reality. My job is to create and maintain a space for the artist-employee relationship to occur. A different way of looking at it is that I see myself as an artist who uses human relations as his medium. At the beginning, I wondered if what I did could be done by a facilitator, a psychologist, a coach, a sociologist, an anthropologist, etc. If that were the case, then why bother hiring an artist. And what experience has shown me is that, it is not the case. There are two reasons for this. The main difference with all these professions is that the relationship between other employees and the artists is bilateral, by which I mean that the employee has as much of an influence on the artist as the reverse. The other professions are more unidirectional. Secondly, all these other professions have objectives in the corporate setting. The job of the coach is to improve the employee’s career and wellbeing, a facilitator is to improve the relations within the company, etc. The artist has no purpose because art has no purpose. The artist has no expertise; he or she may be an expert in a given technique, but has no authority given to him or her by a corporate expertise. That creates a very unique type of relationship within the corporate environment. As for my ambitions for such a job, I first hope others will join me and become Social Sensibility Managers, not necessarily by copying the exact structure we have implemented here but by creating their own type of Social Sensibility space within their own organisations. I also would like to create a specific language for this discipline. Language is important and I would prefer if we didn’t have to use vocabulary either from Contemporary Art or the Corporate world, but if we had our own specific words. This maintains Social Sensibility’s fragility and ambiguity which are very important. Why is ambiguity important? Because today, we live in a very complex world and this ambiguity teaches people to develop their sensibility, which is probably the best tool we have to navigate complexity. Furthermore, with sensibility comes self-awareness, and self-awareness breads empathy. This in turns strengthens the social bond which is another thing we need today more than ever. Q : You have been doing this for the last few years in China and more recently in France. Taking into account the differences in maturity between both sites, what differences, if any, do you notice between both countries? There are many differences, some are cultural, some are socio-political. For example, the relatively “typical” informality of Chinese daily life might have helped the project to begin and to continue in this very open and organic way. Without any guarantee, apart from intuition, we could also say that traditional Chinese philosophy, as an echo of Daoism and Wuwei, might be still present in the root of society (hidden and often compromised but not erased). The curiosity of Chinese people and their desire to try and get to know whatever is new and available also has played an important role. Despite this easier entry point, it is then quite difficult to get deeper into Chinese behaviour and this has been possible only through collaborations with local artists. In France, both the project and I have been “tested” even to a harsh and direct manner, almost confrontational at times. Yet once past this first aggressive phase, the need for people to open up, speak and share has become increasingly difficult to stop. But again if in China there is a feeling of exchange and a step by step continuous movement closer and further away in the relationship with people, during which often an intimate element can appear, disappear and appear again, in France we passed from severe scepticism, fear and doubt to an excess of emotional reactions and a desire to impress and to show off when it comes to engage in creative collaboration. In both cases, it is still difficult to reach the point when the fact of practicing art is in fact appropriated by workers and employees, but if in China this has happened at least in few individuals, in France, due to the shorter time, it still has not taken place. 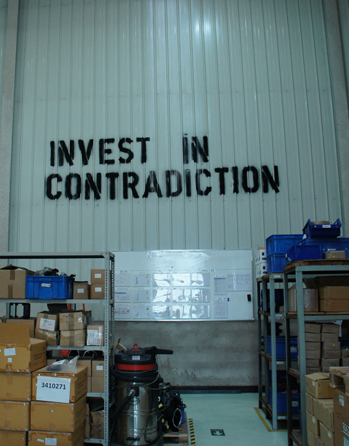 China welcomes ambiguity and so, as long as it is legitimated and accepted by the ruling authority (the company’s CEO and policy), it is unusual but accepted to create an informal situation with the presence of artists on the factory floor. In France, as the cultural format needs a more Cartesian approach to different aspects of life and of course work, a practice that does not progress in a linear way and does not provide clear indicators, goals and targets, is more difficult to accept. Both countries are very sensitive to the idea of implementing a social and cultural policy on the workplace and both have a strong heritage of working class culture, although quite different. The intellectual level where the project is accepted and considered even if it is yet not understood is to France what the ambiguous organic, do-without-doing, listen-observe and let happen, where the project is allowed to evolve without a pre-defined direction, is to China. It is interesting that Social Sensibility as a framework, can happen in both places and develop in parallel but in different ways. After a few more years in Paris, it will be possible to spot other pattern more clearly… or perhaps the organic evolution will just continue. We will see. Q: What do you think were the objectives of Guillaume Bernard, CEO of Bernard Control, when he decided to create this position? The position and the department where created after 8 months of experimentations and dialogue. So when Guillaume decided to go for it, I think he already had a sense that this could have been something different, something “other”. However, he needed some practical and tangible arguments to make sense of it in front of his committee and so we developed and used a typical language related to “human development”, corporate responsibility, cultural policy, and communication-improving for the wellbeing of the company. Having been all the time in direct contact with him during the process, I feel like he sensed something different about what we were doing from the beginning and naturally (not fully grasping it, but intuitively seeing where it could go) he let it develop and being accepted for what it is more and more until the recent presentations in which the spirit and the deep sense and nature of the project are appearing beyond already existing language expressions which facilitate its comprehension. Guillaume, the company in general and I communicate on the project in the same way. As it is something different, we are willing to make the effort of explaining it over and over, but we will not try to smuggle it through some other channel in order to make it easier to deal with. So, to answer the first question, I think Guillaume had nothing specific in mind, but he knew more what he did not want: to sponsor a very shallow, cosmetic, trendy arty initiative. Through a dynamic and exciting process, fraught with doubts and uncertainties, what we are doing took life because it was incubated, protected and fed very carefully in a very “sensible” way. I would say the whole process has been and continues to be deeply honest and for this reason it is also fragile and difficult, but it is not manipulative and it does not pretend to be something else and/or something it is not. Q : What have the other employees’ reactions been like? What it is important is that having contemporary and conceptual practice happening so closely and having the chance (without being obliged) to take part in it according to everyone’s personal wishes, has slowly grown into an important shift within the public from art viewers to art users. How art and the artists are used is complex and heterogeneous. Some people use art for personal or private inquiries about personal discoveries, creativity or curiosity. Some people use art and artists to communicate internal problems through the hierarchy. Others also use them to have a transversal influence on the company’s policies and decisions. Others still are just observers, some sceptical and critical, dismissive, even judgemental. This is also important. This kind of framework offers a lot of space for contradiction, critical thinking and criticism all around; something normally quite impossible within an efficient driven hierarchic structure such as that of a company. The artists and the employees are constantly encountering each other and negotiating the rules of engagement, protected obviously by the legitimacy of the process, but by nothing else. The encounter is not necessary, not mandatory and can lead to nothing. It is and there is no reason and no measurable goal is there to justify it. So, if it does happen, it is because both sides chose to create this mental and physical space and to protect its fragility. This seems to me a very small but very precious moment in which a bilateral exchange happens in an egalitarian form. The possibility for this difficult and fragile encounter to happen is in itself a source of hope for social imagination. Q : What do you think this experiment means for the art world? What would you like it to mean? I wish it to be a test and a call to engage something so complex, risky and without guarantee, something similar to what artistic research used to be, before being compartmentalized and homologated by education, theory and the market. I wish this could be not “the next thing to do” but simply a different field of experience in which art practice can explore new possibilities. I don’t think Social Sensibility should only address artists experts of social practice. On the contrary, it should be for all artists who wants to engage with reality, with people and with the complexity of society. I think Social Sensibility promotes a different frame in which the artist becomes a researcher in a way which is no more naively antagonistic or critical from an external and theoretical point of view, but tries instead to be at the core of the contradictions, at the centre of the paradox, insisting in creating dynamics that do not appear possible or logical, but that can happen and when they do, they mean more for the social bond and for imagining different paths of social engagement. I think Social Sensibility would be valuable if it can continue to exist challenging and testing the conventions of both corporate culture and contemporary art, maintaining a difficult dialogue between the two without falling or being co-opted by one or the other side. Sometimes, I wish for artists and other people to work together using a different language, as a funny exercise, a language that doesn’t quite belong to the art world or the corporate world. Exactly as when Guillaume Bernard and I together , between coffees, digressions and doubts, created the definition “Social Sensibility R&D Department”. Language as artwork. A language in becoming, for a department in becoming. Not falling in the trap of looking for the “next thing in art” or the “next thing in management”, but simply re-arranging the rules about how art takes place and where it does take place, to see if after a while this new set of conditions can generate a new form of art. I am thinking of collaboration with art schools to include once a week research days and internships in companies and other institutions and organizations. Creating a generation of artists for whom a part of their training is research into reality, no matter what their final orientation would be afterwards. Q : As an artist yourself, do you see the Social Sensibility Department as one of your works of art? I think it is my artwork for sure, but not the artwork I dreamed of, not the artwork I imagined, not the artwork I ever expected to be responsible for. It is an artwork which, though born of my initial idea, stops to be artwork and becomes a framework for a new artwork created by the next artist who will created a Social Sensibility department. It is an action in the way Hanna Arendt defines action: something that starts and never finishes because it is continued and modified and transformed by all the different people who are involved and get in touch with it. It is an open canvas in a loose but interesting frame. It is like a living organism, which was born from the encounter between Guillaume Bernard and me, and now evolves through all the different people who participate and join it. I understand my task and that of those who will bring it further, as a constant listening and observing of the process and of the dynamics generated by the Department in order to maintain its organic and fluid nature and its natural capacity to generate creative environments and exchanges. As I said before, I would have never imagined doing something like this before. There is a creative path that is about listening and to observing without being too worried with what one should chose or do. This attitude leads one to explore unexpected territories and to experience unexpected moments. It also leads down paths we did not know or think of, which are often more interesting, surprising and challenging than those we consider. Perhaps because these paths are no more just individual patterns or convictions or goals, but they are more like undercurrents already present in society in a very primordial and hidden state. The way I came to Social Sensibility is also the way Social Sensibility works. Authorship is diffused and there is no straight logic track of the projects and of their impact. There is a current injected into a well-defined and well-regulated existing structure, which affects it as a whole, slowly and deeply. Q : What do you think this experiment means for the corporate world? What would you like it to mean? Ii is not simple to say what it does mean for the corporate world. It is not simple because the corporate world is no as homogeneous as we tend to think. For some CEOs companies are more than just profit-oriented entities, for others they are merely economic machines, and for others still they are entities capable to define our present and future behaviours. I think Social Sensibility can be a chance for the corporate world. A tool to develop regulatory systems in the realm of quality and human relationships, those more at risk under the current life-pressure. These questions cannot be faced only with strategic calculations or technocracy. The social bond is too important. Corporations are the most powerful and representative forms of organization of our time. They contain all the contradictions and the potentiality of the human species: those to maintain and transport it into a new era and those to annihilate it forever. This power and this potentiality do need a different energy a different quality, to be able to evolve and to avoid implosion or explosion. No matter how miniscule the impact can have on such a gigantic process can seem, I believe it is crucial. Art has the capacity (still for now at least) to be and become everything and anything, to penetrate and influence people’s sensibility and inform them about the importance to grow, cultivate and protect diversity, intuition, social interactions and practices that do not seek to impose but to instead cultivate doubt and introspection. Q : Do you think there is a societal transition happening at the moment ? If so, how would you define it? I think there is a huge change coming and is too difficult to resume. It is like in that reading of the YiJing in which the zenith of something already contains its nadir. We are already in very dangerous times, but somehow a different consciousness among the young generation is growing. It is hidden and local, but it is a bit like monks preparing libraries in the middle ages to preserve culture from the barbaric invasions before the Renaissance. There is a counter trend. It is grassroots, underground, really diffused and very diverse, but which common root is that if we want to survive and implement all the wonderful ideas and discoveries we have, first we must re-build the social bond and re-imagine it. It might be quite difficult and going through dark moments but it is around, growing. Art and culture can play multiple roles in it: accelerating the fall, creating shelters, unable thinking of an afterwards, perhaps even suspend and reverse the current suicidal speed. Q: Finally, what is the question I haven’t asked but should have? There is no question you “should” have asked; the only problem is to stop asking questions.